Jazzing up the night (& day) with Cape Town City Ballet. Photo by Michael Groenewald courtesy of CTCB. 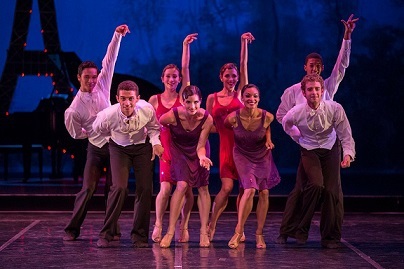 Whether you’re looking to end the holiday on a high note, or kick start the new year with some memorable melodies, Cape Town City Ballet will have you tapping and clapping to the lively tunes of legendary singer/songwriter Cole Porter with their production of Night & Day, on at Cape Town’s Artscape Theatre until 11 January 2014. Showing off the versatility of Cape Town City Ballet’s dancers, this production blends ballet with tap, cabaret and jazz set to Porter’s witty lyrics and charming tunes. You’ll recognise songs like Let’s Misbehave, I’ve got you under my skin and It’s too darn hot; and for days afterwards you’ll be humming It’s delicious, it’s delightful, it’s De-Lovely as well as Let’s do it, let’s fall in love. And here’s another special old-time treat with Fred Astaire and Ginger Rogers performing Cole Porter’s Night and Day. Tickets: From R150 or children (6 to 16 years) at R50 through Computicket.